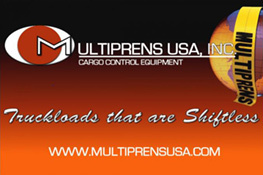 Multiprens USA, Inc. has been in the cargo securement industry for over 20 years. In 1985, Bill Tayloe ran an aviation business under the name of Priority Aviation. This successful business of transporting documents opened the doors of opportunity for Bill. The need for tie-down equipment was evident. Priority Aviation went from the aviation industry to the trucking industry. Established in 1986, Priority Products started out supplying the trucking industry with jacking type load bars. The rest of the story is history. Multiprens USA opened its business in 1996, to manufacture and distribute jacking type load bars. Soon it became apparent all its customers wanted a broader range of cargo securement products. Multiprens USA quickly expanded its product line to include a variety of load bars, decking beams, shoring bars, strap assemblies, winches, auto tiedowns and towing, transport chain and binders and safety products. To accomplish these goals Multiprens USA has associated itself with the best management personnel having a strong background in the cargo securement industry. Multiprens USA manufactures and acquires products from all around the world to offer the best quality products and pricing in the industry. Multiprens USA is proud to be a member of these great oganizations. Our mission is to be the trucking industry's leader of Excellent Customer Service, Quality Products Delivered on Time, and at a Fraction of the Cost.